When you a stay at Schweizerhof Pontresina in Pontresina, you'll be near ski lifts, just steps from Swiss Alps and Bellavita Pool and Spa. Featured amenities include express check-in, express check-out, and complimentary newspapers in the lobby. A train station pick-up service is provided at no charge, and self parking (subject to charges) is available onsite. With a stay at rent-a-home Schweizergasse in Basel, you'll be a 2-minute drive from Basel Zoo and 8 minutes from Spalentor. Featured amenities include express check-in and express check-out. 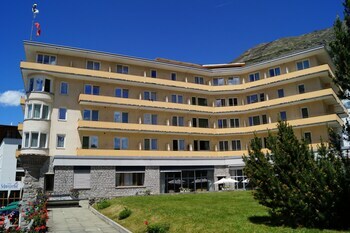 With a stay at Interlaken Happy Central Apartment in Interlaken (Central Interlaken), you'll be steps from Swiss Alps and Kletterhalle Interlaken. Located in Le Locle, this bed & breakfast is a 3-minute drive from Musee des Beaux-Art and 7 minutes from Moulins Souterrains du Col-des-Roches. Free self parking is available onsite. With a stay at this apartment in Grindelwald, you'll be near ski lifts, just a 1-minute walk from Swiss Alps and 6 minutes by foot from Sportzentrum Grindelwald. Free self parking is available onsite.